Chemistry X | Acids, Bases and Salts | Are the Crystals of Salts really Dry? Heat a few crystals of copper sulphate in a dry boiling tube. What is the colour of the copper sulphate after heating? Do you notice water droplets in the boiling tube? Where have these come from? 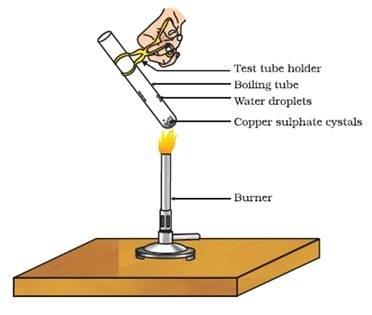 Add 2-3 drops of water on the sample of copper sulphate obtained after heating. What do you observe? Is the blue colour of copper sulphate restored? Copper sulphate crystals which seem to be dry contain water of crystallisation. When we heat the crystals, this water is removed and the salt turns white. If you moisten the crystals again with water, you will find that blue colour of the crystals reappears. Water of crystallisation is the fixed number of water molecules present in one formula unit of a salt. Five water molecules are present in one formula unit of copper sulphate. Chemical formula for hydrated copper sulphate is Cu SO4. 5H2O. Now you would be able to answer the question whether the molecule of Na2CO3.10H2O is wet. One other salt, which possesses water of crystallisation is gypsum. It has two water molecules as water of cyrstallisation. It has the formula CaSO4.2H2O. Let us look into the use of this salt. Paris, the substance which doctors use as plaster for supporting fractured bones in the right position. Plaster of Paris is a white powder and on mixing with water, it changes to gypsum once again giving a hard solid mass. Note that only half a water molecule is shown to be attached as water of crystallisation. How can you get half a water molecule? It is written in this form because two formula units of CaSO4 share one molecule of water. Plaster of Paris is used for making toys, materials for decoration and for making surfaces smooth. Try to find out why is calcium sulphate hemihydrate called ‘Plaster of Paris’ ?